Bee balm is beautiful and makes a wonderful tea. If you’re new to gardening, one of the easiest and most satisfying ways to get started is by growing herbs. Herbs are easy to grow, and you can grow everything from culinary herbs to aromatic or medicinal. Here are some tips for planning and growing an herb garden. 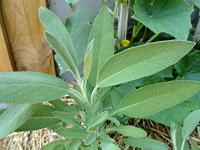 Herb Types: Herbs can be annual, perennial, or evergreen. Check out our list of annual and perennial herbs to find out which are which. Be Creative: Herbs do well in containers, hanging baskets, and flower beds. You can line your walkway with evergreen herbs like rosemary, fill window boxes with annuals like basil and parsley, and tuck perennials like oregano into your planting beds. Start Small: While herbs are fairly easy to manage, they will get spindly and lose their flavor if left untended, so don’t plant more than you need. Herb Location: Locate herbs as close to your kitchen as possible, so you can run out and snip fresh leaves as needed. Herbs also need to be in a convenient spot where you can easily reach them for pruning, watering, and harvesting. Herb Appeal: In addition to being delicious and fragrant, many herbs are also beautiful. For a little color in your herb garden, try some blooming herbs such as bee balm and chamomile. Herb Size: Some herbs are quite tall, while others are low and spreading. When laying out your garden, make sure that taller plants won’t shade (or hide) the shorter ones. Put tall plants in the middle, or toward the back, with lower growing plants around the edges. Herb Planting Options: Many herbs are easy to grow from seed, and you can also buy already growing plants in a variety of sizes. Garden centers and farmer’s markets even have pre-planted herb containers, ready to water and enjoy! Most herbs do best when planted in full sun. Sunlight: Most herbs do best with at least six hours of sun a day. A few herbs – such as mint, dill, and cilantro – will tolerate some light shade, but for the most part your herb garden should be in full sun. Air Circulation: To prevent diseases and mold, be sure your herbs are spaced so they will receive plenty of air. Drainage: Good drainage is very important with herbs, particularly Mediterranean herbs – such as thyme, rosemary, and oregano – that are native to dry, rocky soils. To improve drainage, amend planting soil with crumbly compost. When growing in containers, use a well draining potting mix (not garden soil) and be sure the pot has unobstructed drain holes in the bottom. Fertilizer: Herbs like nutritious soil, but it’s important not to overdo it. An overdose of nutrients might make plants grow faster, but they won’t have as good a flavor as herbs allowed to grow in a more moderate environment. Good compost is often all you need, or feed herbs lightly with a balanced, slow release fertilizer. Basil and sage in handy pots near the kitchen. Herbs are perfect for containers – they have lovely colors and textures and spill out beautifully over the edges of the pot. Any herb will do well in containers, and they’re particularly useful for invasive herbs – like mint – that can take over your garden. Try planting a mix of herbs in a large planter or barrel, or make a collection of small pots. Add flowers for color if you like. You can move the pots around, and even bring them indoors over the winter, where the smaller plants make great centerpieces. Encourage branching by cutting back the tips of herbs to a leaf node. Watering: Herbs do well with about an inch of water per week. Containers will need water every couple of days, and possibly daily during heat waves. Well hydrated herbs are much tastier than dried out or repeatedly wilted plants. However, most don’t like wet soil, which is why drainage is so important. Harvesting: To keep your herbs looking full and not sheared, harvest by cutting or pinching entire pieces of stem, all the way back to a leaf shoot. If you take small cuttings like this from multiple stems, your harvest won’t be missed. Remove buds from leafy herbs. Pruning: Pruning herbs encourages them to branch out, which will give you more to harvest! And it’s easy to do – when selecting herbs for tonight’s dinner, pinch off the tips of the longest stems. You’ll get your handful of leaves for cooking and take care of pruning, all in one step. 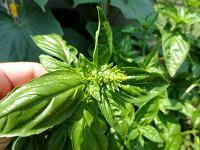 Blooming: Leafy herbs, like basil, will lose their flavor and slow down leaf production if allowed to bloom. Unless you’re harvesting herbs for their flowers or seeds (such as chamomile or coriander), pinch off any flower buds that start to form on leafy herbs. Pests: The natural aromatic oils in herbs make excellent natural pest repellents. However, keep an eye out for critters that might damage your plants. Many herbs attract beneficial insects, so don’t worry about any bugs that aren’t causing harm. Diseases: Herbs are also generally pretty resistant to diseases, although fungal diseases and other problems can arise on occasion.